SPACE.com staff writer Miriam Kramer looks on at the Minotaur V rocket that will propel NASA's Lunar Atmosphere and Dust Environment Explorer mission. 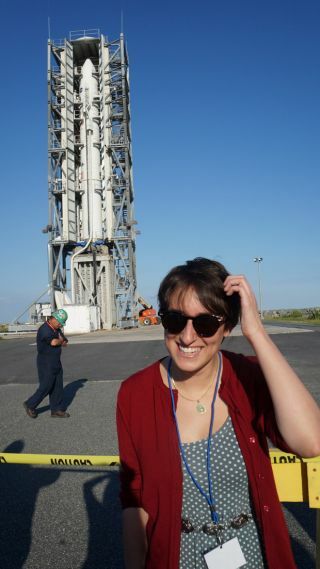 WALLOPS ISLAND, Va. — There's nothing else quite like standing in front of a brand-new rocket before it launches. NASA's Lunar Atmosphere and Dust Environment Explorer spacecraft, set to launch today (Sept. 6) from here at NASA's Wallops Flight Facility is now tucked away inside the Minotaur V rocket that will catapult it out of Earth's atmosphere, sending it on a journey to the moon. There is much cause for excitement about NASA's next mission to the moon. LADEE is heading into lunar orbit to investigate a moon dust mystery dating back to the Apollo era. Apollo astronauts saw a strange glow on the moon's horizon before sunrise. LADEE's scientific instrumentation could help scientists understand if that glow was caused by particles of dust in the lunar atmosphere. The launch should be visible, weather permitting, along the East Coast of the United States. Find out how you can watch the launch live here.